Casablanca is a cassette awning perfect for large terraces.Thanks to its built this awning is not only a perfect way of protecting from the sun, but also an aesthetic decorative part of the building.Specially designed construction from extruded aluminium ensures strength and durability of the awning, and Flyer’s chain used in the arms guarantees its long-term dependable operation. 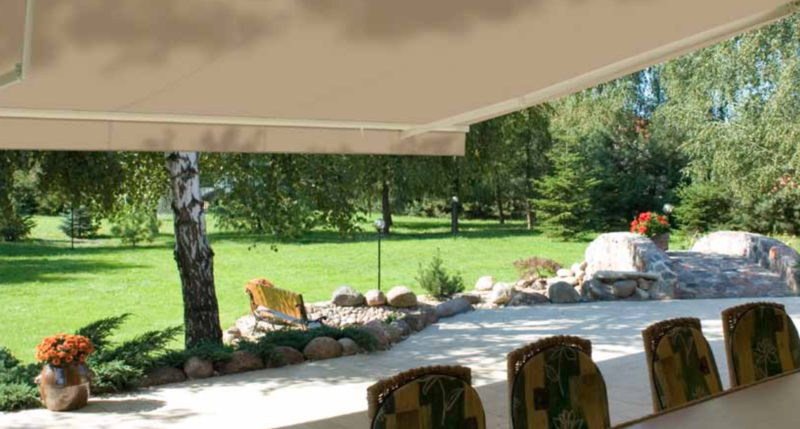 Wide awnings are equipped with roller tube support to ensure that the fabric is evenly tightened. Special gaskets placed in the cassette further protect the fabric from weather conditions. What is more, properly selected electric control with weather sensors will make handling theCasablanca awning very easy and functional. 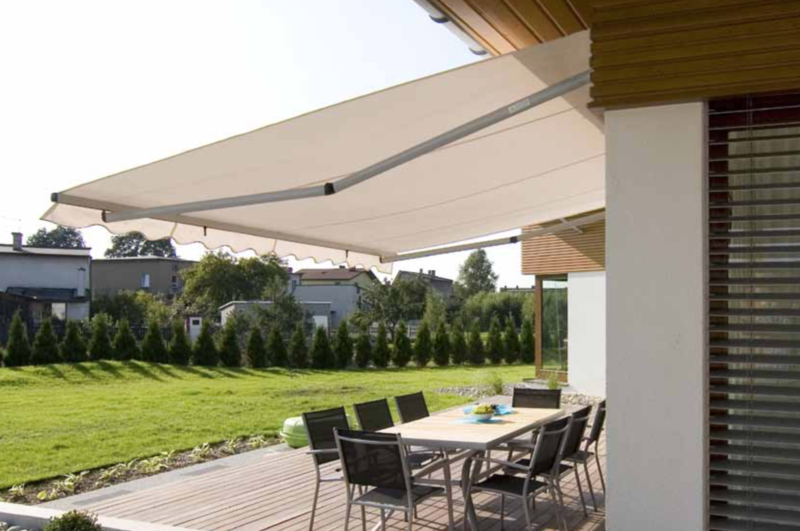 Corsica is an awning designed with the idea of shading modern terraces in mind. 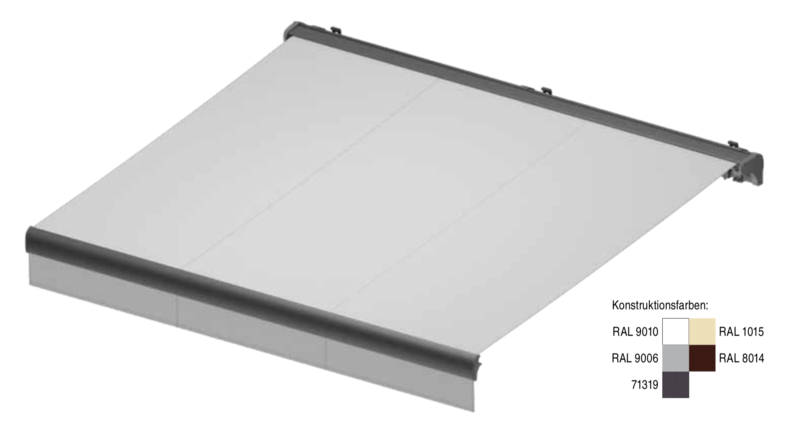 Its construction is made from extruded aluminium, which ensures strength and durability of the awning, and Flyer’schain used in the arms in connection with precisely made joints guarantees its long-term dependable operation. The cassette is supported by square bar providing stability for the whole construction while making the installation easier. 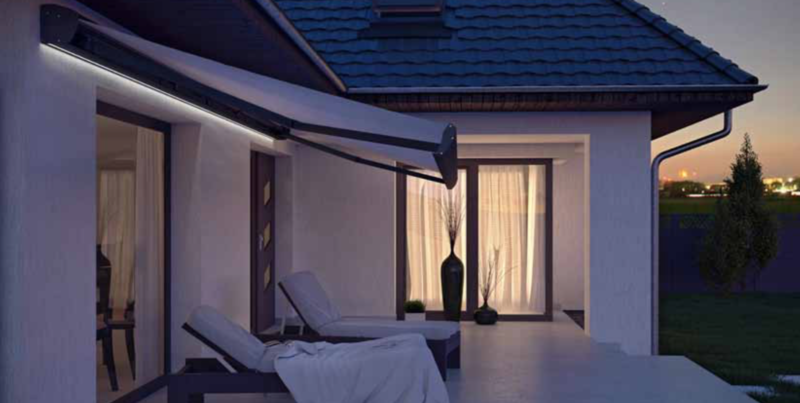 Corsica was designed to provide the possibility of installing LED lighting which allows the user to fully enjoy pleasant summer evenings. 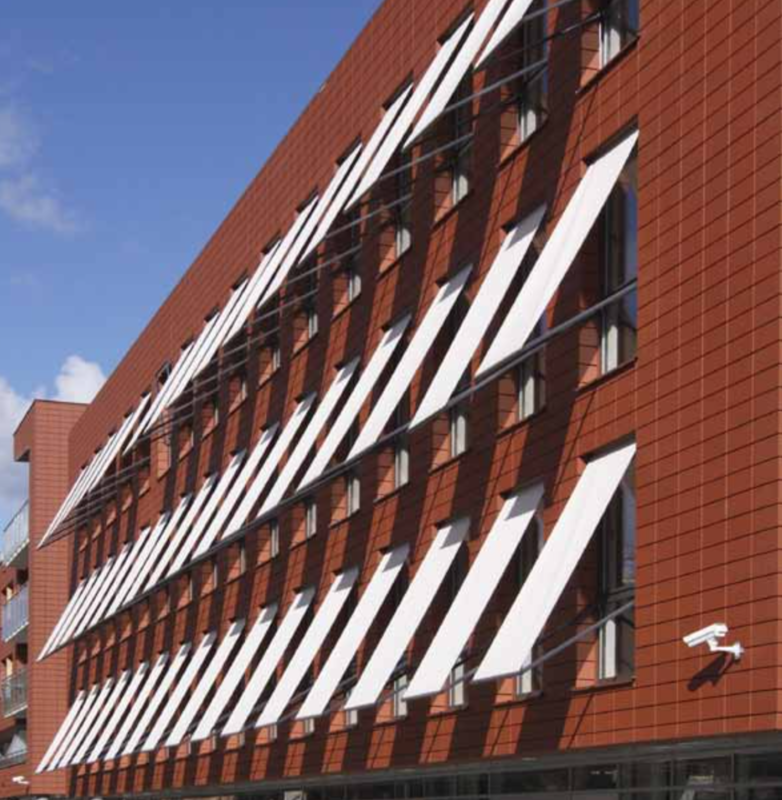 This awning, thanks to its aesthetically pleasing design can, apart from shading from the sun, serve as a perfect decorative element of the building, highlighting its individual and unique character. Giant thanks to its very solid construction makes for a perfect way of shading large surface areas, like terraces or open-air restaurants, becoming a great alternative to the more permanent roofing systems. Construction is made from extruded aluminium and supported by double square bar. 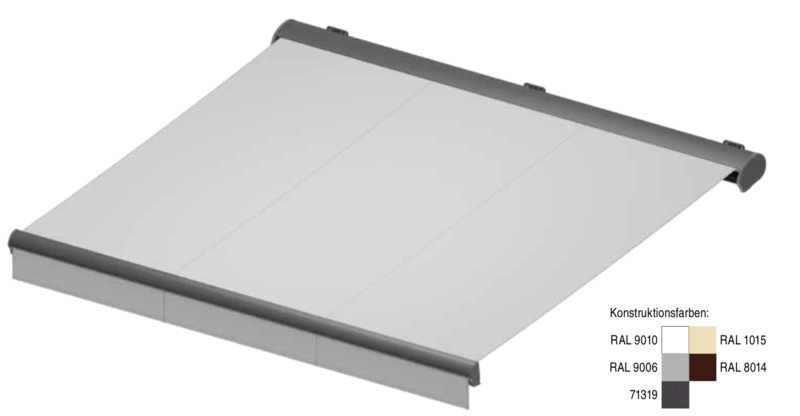 Aluminium arms with forged components make it possible to achieve even 5m projection. 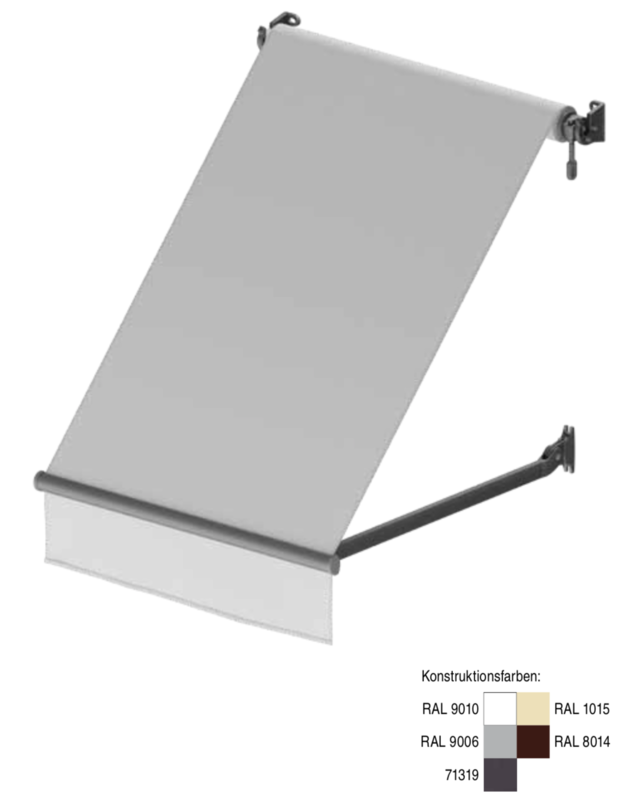 Flyer’schain used in the arms guarantees long-term dependable operation of the awning. 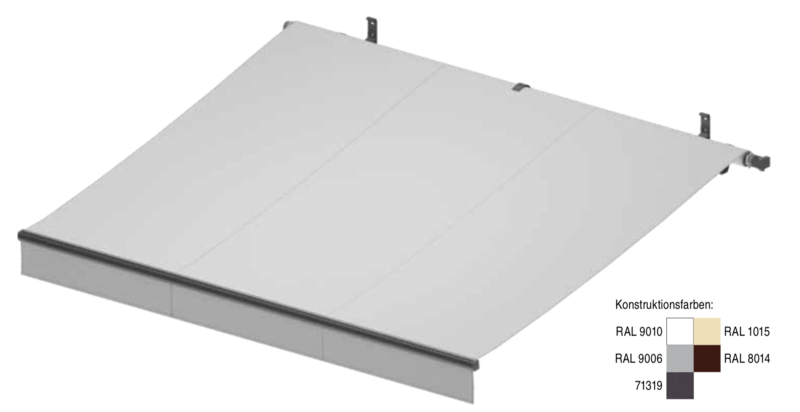 The possibility of using aluminium hood allows to partially protect the rolled-up fabric from weather conditions.Properly selected electric control along with weather sensors will make handling the Giant comfortable and easy. Malta is a light, free-hanging awning, perfect for shading smaller terraces or balconies. 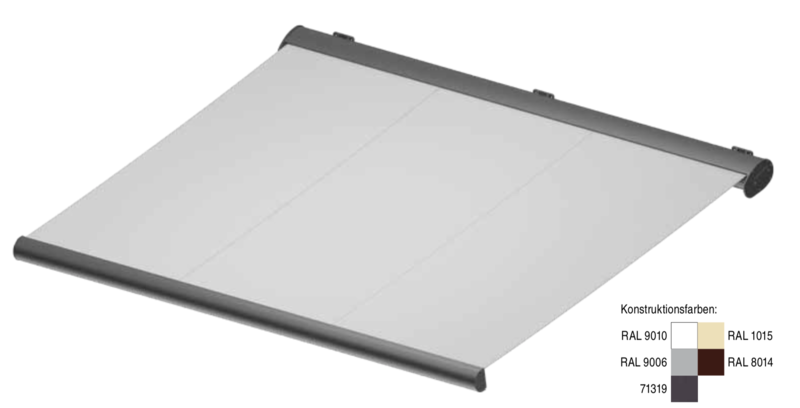 Its compact construction features a universal ceiling and wall bracket, which enables fast and simple assembly and also allows for setting a tilt angle up to 85 degrees. Flyer plate link chain used in the articulated joints makes them durable and reliable. 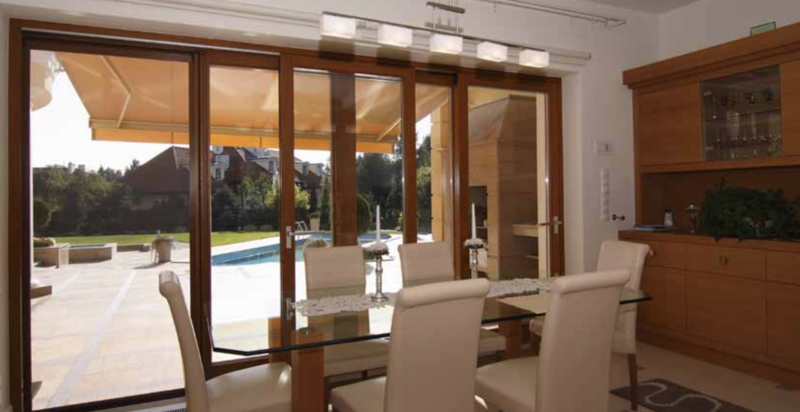 The construction of the awning is powder lacquered in five standard colours. Australia is perfect for big terraces. Simple construction and high-quality workmanship make it suitable for commercial applications. 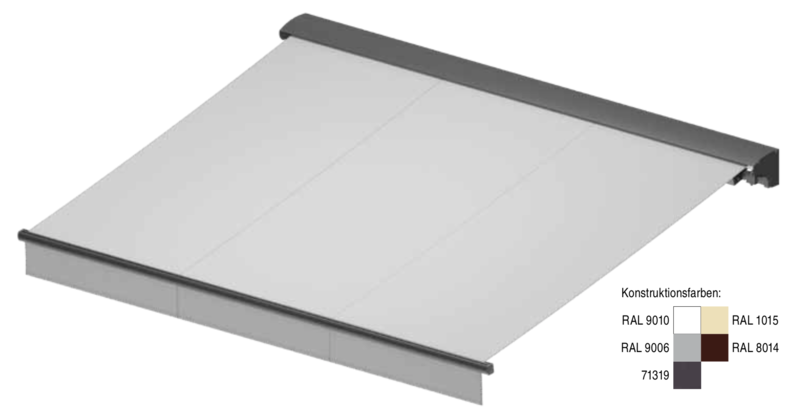 The awning’s folding arms are installed on aluminium brackets made through pressure casting. The precise manufacture of the articulated joints, as well as the plate link chain applied in them, provide durability and dependable operation of the awning. 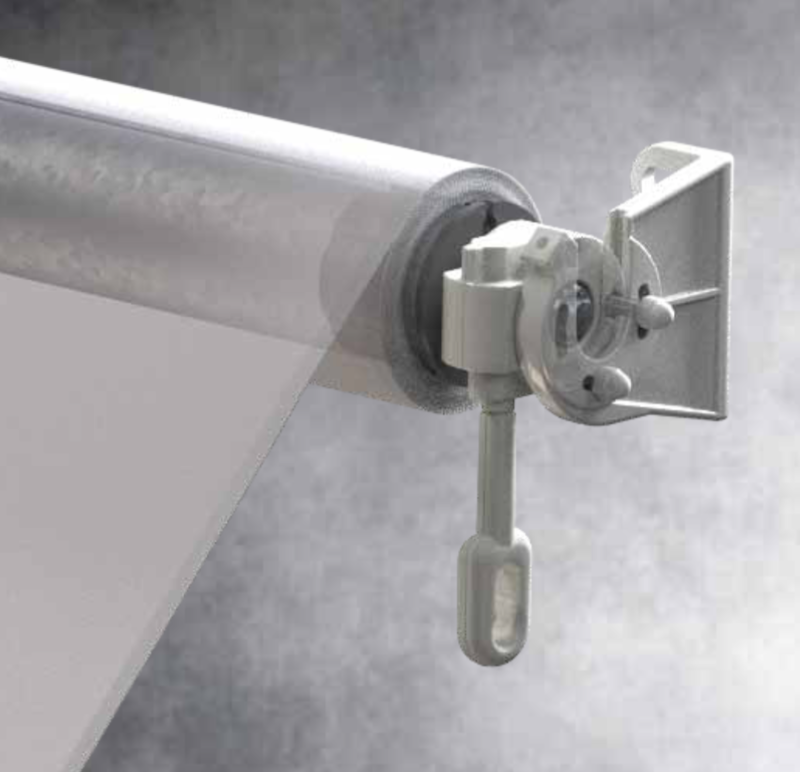 A central support for the roller tube in the case of particularly wide awnings compensates for tube deflection, thus providing good fabric tension. The construction is supported by a square steel beam that gives relative freedom of bracket location and simplifies the awning installation. The construction of the awning is powder lacquered in white, graphite, silver with graphite finish, beige, and brown. There is a possibility to use overlapping arms in this awning. 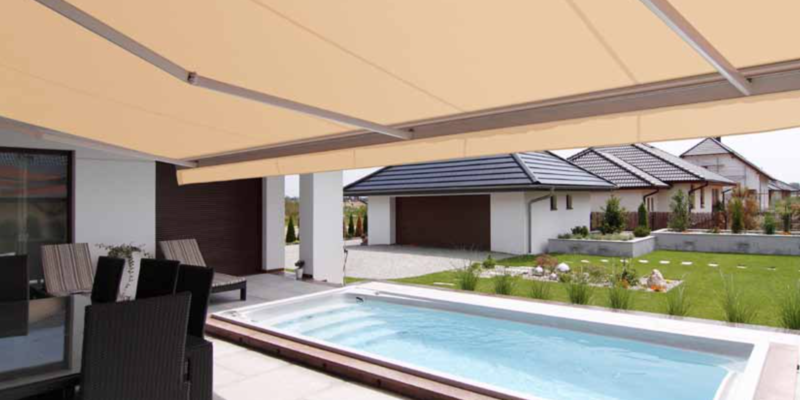 Palladio is an elegant cassette awning that looks excellent on terraces. 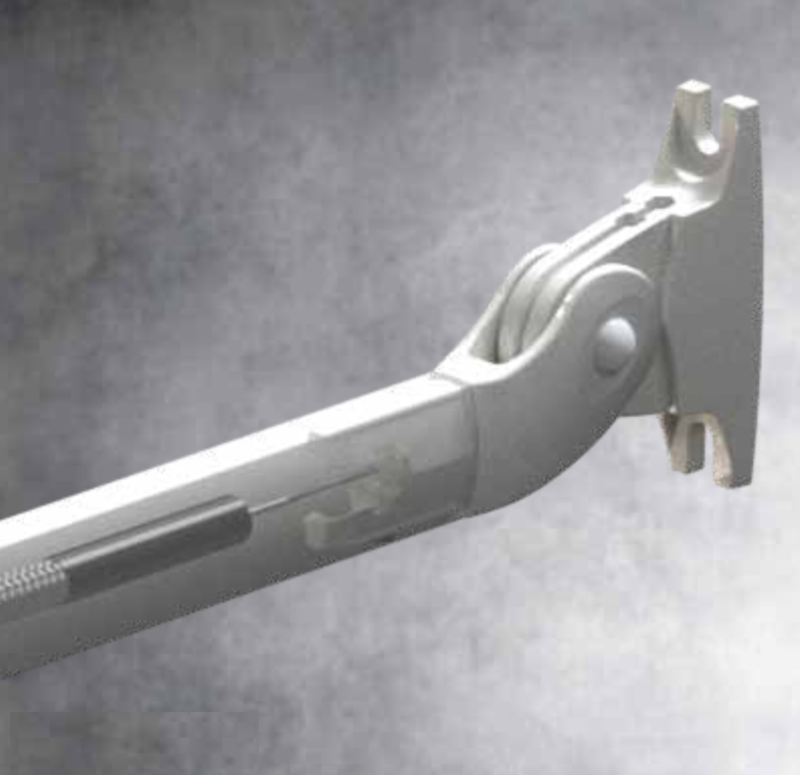 The special arm bracket construction enables lifting the arms and closing the front bar tightly on the cassette, thus covering the rolled-up fabric. A plate link chain applied in the arms and precisely made articulated joints guarantee long-term dependable operation of the awning. Elastic supports for the roller tube ensure even tension of the fabric. 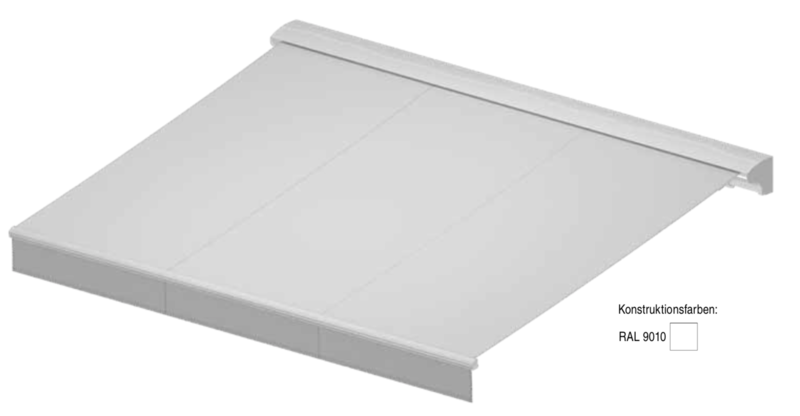 Palladio combines the characteristics of a cassette awning and a square beam-based construction. Such solution allows us to fully take advantage of cassette awning functionality and simplifies its installation. The construction of the awning is powder lacquered in white, graphite, silver with graphite finishing, beige, and brown. 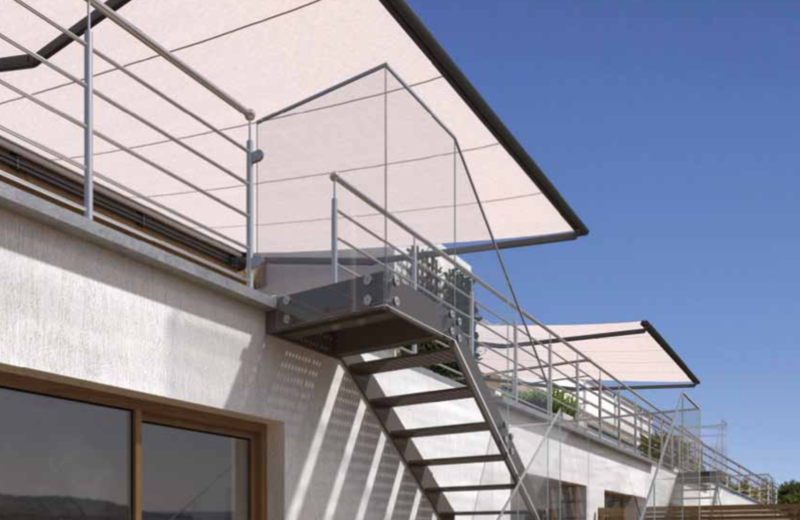 Dakar is the perfect solution for shading large terraces. A full streamlined cassette gives the awning a modern and elegant look and also protects the fabric and arms from weather conditions. To increase the protection of the fabric safety gaskets are applied inside the cassette. Folding arms made of aluminium alloy are mounted with aluminium brackets made through pressure casting. Precise joints with a plate link chain of stainless steel guarantee their durability and reliable operation. 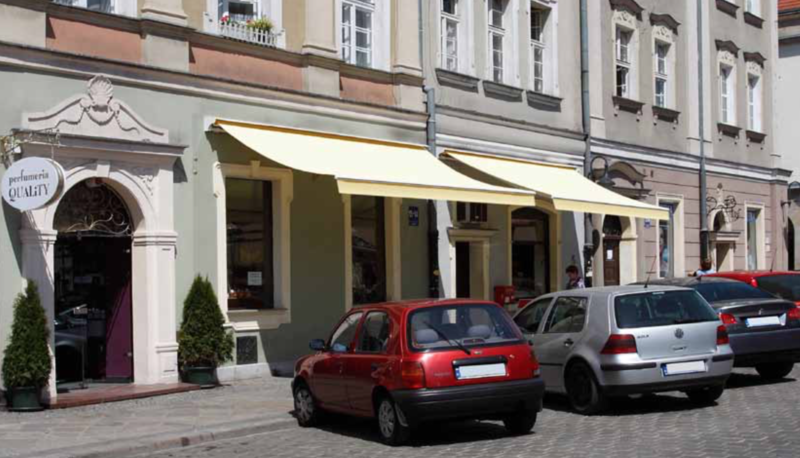 Awnings with a larger width are equipped with a support for the roller tube, thanks to which the fabric is stretched more uniformly. The construction of the awning is powder lacquered in white, graphite, silver with graphite finishing, beige, and brown. 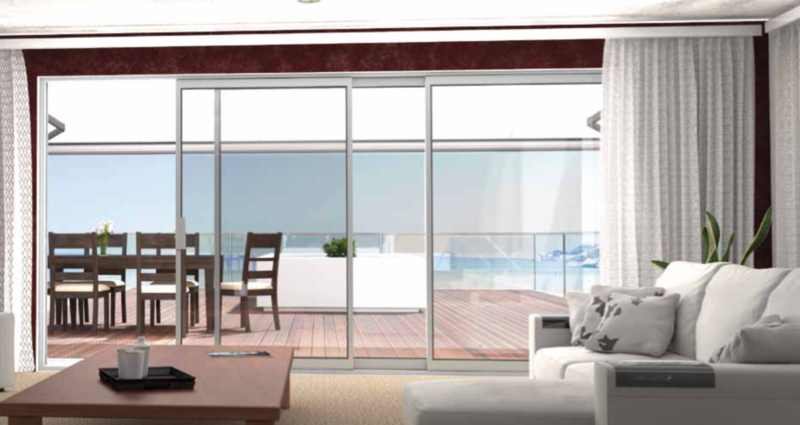 Balcony Italia is an aesthetic solution for protection from the sun. It is also a practical decoration for balconies, terraces and balcony niches. The characteristic arms for this awning are fixed to the balcony balustrade. Their construction enables proper inclination adjustment. There are hooks at both ends of the arms that latch onto the front bar. Suitable fabric tension is achieved by rolling-up any excess fabric. The light construction makes awning installation very easy. Balustrade arms give more freedom for installation on balconies. Construction elements are powder lacquered in white colour.